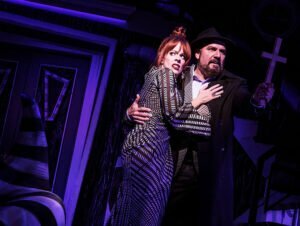 Save on Beetlejuice on Broadway tickets by purchasing them before you go to New York. Buying Theatre tickets online is easy, safe and, above all, saves time and money. Head to Winter Garden Theatre to see this show! 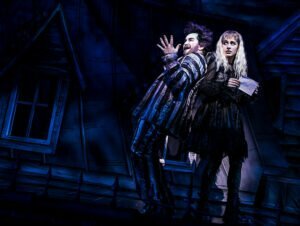 Beetlejuice the musical is based on the 1988 Tim Burton cult classic movie of the same name, about Goth-teen Lydia Deetz, who is obsessed with the dead. Lydia and her parents are moving, and it appears that there are a couple of ghosts inhabiting their new house. The previous owners; Barbara and Adam were both killed in a car accident and are now trapped in their old home. Lydia is the only one who can see them. Together, they summon demon Beetlejuice to help them kick Lydia’s parents out of the house. Beetlejuice’s plans, however, are quite extreme. Not everyone is so enthusiastic about his approach. It is easy to buy tickets for Beetlejuice via the link below. I recommend buying tickets online before you go to New York. Why? A lot of shows are very popular and often sell out. You’ll also save time, money and, most importantly, you won’t have to stress about finding tickets when you are in New York. Seats are assigned by the theatre, which is why you won’t know your exact seating at the time of booking. Seat numbers will be clearly marked on the tickets. For bookings of up to 4 people, you are guaranteed seats together. For larger groups, the theatre will try its best. Send me an email at eric@newyork.com.au if you want to book for groups of 15 or more. Don’t want to see Beetlejuice?